Born in the Philippines, Eunice Kindred found success early exhibiting at solo and group shows, galleries, and festivals. Highlights include the Tampa Museum of Art and being selected for the Congressional Art Competition in Washington, DC. She received a BA from Harvard University's visual studies program. Because of her numerous talents beyond art"”notably in dance, music, and athletics"”she is considered to be a modern-day renaissance woman yet continues to fuse her artistic boundaries. She lives and works in New York City. 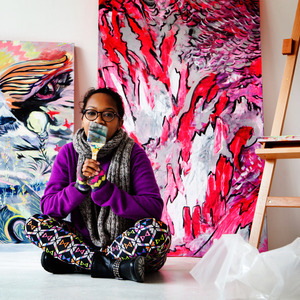 Eunice explores the nature of freestyling through painting, each painting is inspired and created to a soundtrack"”allowing her to visually communicate a musicality and choreography of movement through color and application of strokes and paint onto a surface. The inspiration of each piece draws from a relationship with the medium, the relationship through songs and lyrics, and the musicality of each track and its interpretation into visual form rather than movement. This exploration creates a tension between time, composition, and expression; encouraging the viewer to experience the play between sight and sound.